All of this, combined with the fact I’ve given a handful of presentations in Lane County this year, leads us to this edition of the Graph of the Week. While population growth is overall advantageous — even if it does come with some growing pains — the type of growth matters. 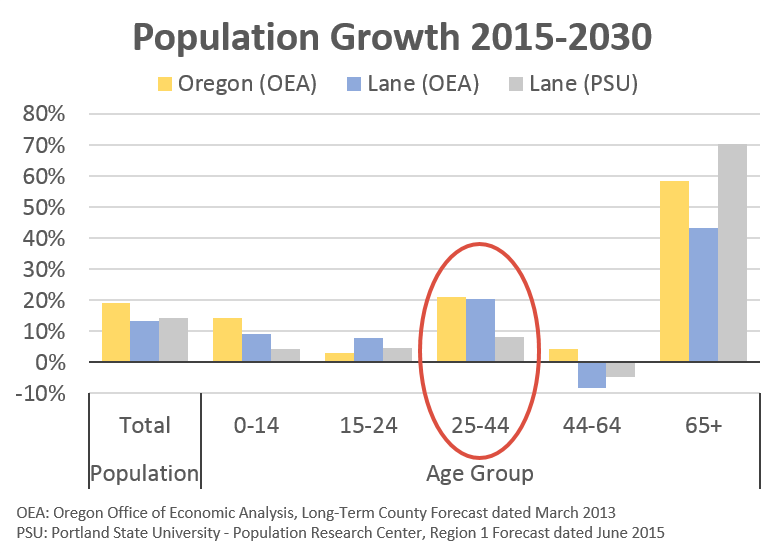 The chart below shows expected population growth in Oregon and in Lane County (Eugene MSA) based on the most recent population forecasts from our office and from Portland State’s Population Research Center. The point here isn’t to argue about which forecast is best, but rather to highlight the implications of the differences between them. First, notice over on the left. Both our office’s 2013 forecast and PSU’s 2015 forecast for Lane County are pretty much identical. Our office forecasts annual population growth to be 0.85% between 2015 and 2030, while PSU forecasts it to be 0.90%. No real difference. However the composition of that growth is considerably different. Our office’s outlook expects growth in the all-important 25-44 year old age group to be twice as fast as what PSU forecasts. Conversely, PSU expects growth in the 65+ age group to be nearly twice as fast as our office’s forecast. In terms of the longer-run outlook, or in terms of the region’s potential economic growth, which forecast is more accurate is Lane County’s million dollar question. If reality is closer to the blue bars, Lane County will see stronger economic growth moving forward. From an industrial structure perspective, the region looks solid. There is not some local imbalance that is likely to hold back growth relative to the rest of the state. However, if reality is closer to the gray bars, Lane County’s overall economic growth would be expected to be slower. The limiting factor would not be the industrial structure, but the labor force. These questions, and the implications that arise are important to each regional economy. I am using Lane County as an example because I have spent more time lately thinking about the Eugene MSA and also because of the relative differences in the two outlooks. Again, I’m not trying to argue which forecast is best, but rather to highlight the differences and how to think about the outlook. Note that Portland State’s Population Research Center is currently working on updating the Region 1 forecasts (including Lane). In the past month they have held public meetings to discuss the data and outlook, and will release the new forecasts by mid-2018. Finally, a few summary notes on the Eugene MSA. The Great Recession was more severe in Lane County than in much of the state. The region’s lost manufacturing jobs are not cyclical, but structural. In some other regions, manufacturing losses were largely cyclical. Not in Lane County. It takes a long time to reorient an economy after suffering such large losses. As such, the Eugene MSA’s recovery took awhile to get going, however growth in recent years has been pretty good. The region’s jobs gap — the difference between actual employment trends and population growth — is nearly gone. Overall, the Eugene region’s economic trends closely track the typical urban areas across the country in recent decades. Furthermore, the region’s trends closely track those seen in other parts of the country that have similar industrial structures. Looking forward, Lane County’s industrial structure is pretty well balanced for growth, when compared with the state overall. There is not some industrial structure imbalance that looks to weigh on growth moving forward. It’s interesting that PSU has such strong growth in the 65+ age category. Lane does get some in-migration from retirees in the coastal area around Florence, but that’s a relatively small portion of the overall county population. The Eugene area also has available health care with the Riverbend hospital and a VA clinic that may be attractive to retirees. On the other hand, we also get some young professional, lifestyle in-migration and there are U of O graduates who want to stay in the area. It will be interesting to see if PSU makes an adjustment to the forecast when it is published in mid-2018. Thanks Brian for the insights; I appreciate them! I’m copying the comment into the post to make sure others see it as well. Yeah, we shall see what changes are made. Our forecast was based on the 2010 Census being the underlying jump-off point. I think PSU used their 2013 estimates as the jump-off point. So to the extent those diverged, that could explain some of it. But my bigger observation in the data is that PSU basically assumes that none of the college kids stick around, and the existing younger population in the county declines as they age (current children and high schoolers move away when they get a bit older). I personally have a hard time with that outlook, but it doesn’t mean it’s not the correct one. And, obviously, those differences have huge implications. Good to hear that the Eugene area can be expected to expand, after such devastating losses of major employers over the years. The entire timber/wood products industry, Hynix, Sony, RV manuf…..all hammered their economy. They deserve better….it’s a terrific little city! Thanks Randy. Yes, the structural changes in Lane County have been massive. Much larger than in the typical region. And yet! Eugene has largely tracked the growth patterns seen across the nation’s metro areas. More volatile over the business cycle, of course, but on net keeping up with the pace. That’s a huge positive. Be interesting to put this one in a time capsule and come back in 13 years and see how things actually turned out. Also, the difference between these forecasts in the younger age brackets could have a major impact on the K-12 school districts. The lack of agreement between the forecasts is perhaps more than anything else simply a reflection of how difficult forecasting can be. Thanks Bill. Yes, K-12 populations as well. Even if it’s not always pretty, it is important to go back and check forecast accuracy. See what you can learn from your past mistakes. Thanks for taking the time and the thoughts/questions. Affordability is obviously a big problem. To date, it’s actually hard to see an impact on population growth or migration trends. It is clear that households are spending more money on housing that before. And it is clear we’re seeing displacement of where lower-income households live. But to date we haven’t really seen, say, lower-income households move out of Oregon entirely, unlike in California and some other high cost regions of the US. But, to the extent that affordability continues to worsen, it will slow growth as fewer young, working-age households move to Oregon. Then our long-run economic and revenue outlook would be revised lower as a result.